It is getting harder and harder to be a breakout prospect with the myriad number of blogs, websites, and other assorted media out there to capture Cub prospects in action. Last year, Adbert Alzolay was the Cubs’ breakout pitching star going through two levels like a hot knife through butter. Meanwhile, 2017 5th round pick Nelson Velazquez clubbed 8 HRs in about 6 weeks of ball in August and early September to take the breakout hitting award. This year, things are a little different when identifying the breakout performances of the first half. When it comes to pitching, Myrtle Beach starter Matt Swarmer currently leads the pack. He was the Cubs’ April Pitcher of the Month going 20.2 IP with 27 Ks. This month, Swarmer is making his second trip around the 10-team Carolina League and things are a bit tougher. He has a 3.82 ERA in May over 11.2 innings but he’s struck out 16 and walked just 1. I think you can chalk that up to one bad inning. Still, more data is needed before we declare Swarmer the breakout pitcher of the first half. Another pitcher who seems to breaking out is Rollie Lacy of South Bend. Like Duncan Robinson and Michael Rucker did last year, Lacy began the year in the bullpen. He was dominant in 5 of his 6 relief outings striking out 25 in 18.2 innings. As a starter, he’s made two starts and is still stretching his arm out. I like what I see as he does fool a lot of hitters by changing speeds and keeping the ball down in the zone. While he did not strike out any in his first start, he whiffed six in his second. While I doubt if he could overtake Swarmer for the Award for the first half, he is definitely one to watch in the second half as he acclimates to starting at this level. I love to watch Keegan Thompson pitch. The young man knows how to work a hitter and a strike zone. Every time he pitches, he improves over the last outing. He put up a 4.19 ERA in April after skipping South Bend to begin his first year in full season ball. That, in and of itself, is an adjustment. Now that May is here, Thompson is delivering with a 2.65 ERA for the month in three starts. He has 18 Ks already for the month surpassing his total for all of April in half the time. Thompson just looks like he knows what he wants to do on the mound. He should be a fun watch. In the bullpen, Tyler Peyton was my pick to breakout in relief and he has done everything to make me look good. The 2016 draft pick out of Iowa has really taken to the bullpen. He did well at times last year in South Bend, especially in August when he had a 1.29 ERA for the month. 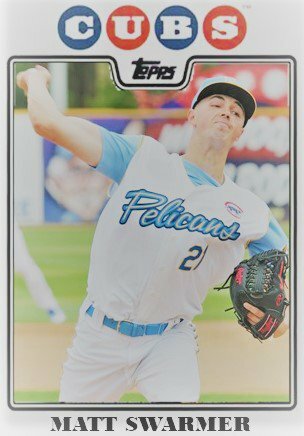 So far, Peyton has a 1.35 ERA in 20 innings with 20 Ks and he has begun to close for the Pelicans, opposite fellow closer Jhon Romero. On the other hand, hitting in the Cubs’ system is down quite a bit in 2018. As a result, it is pretty easy to pick out prospects who have a spike in their performance at the plate. While Austin Filiere is having an outstanding year for South Bend, he pretty much broke out last summer at Eugene but was overshadowed by Nelson Velazquez down in Mesa. The same is true for Zack Short and Jared Young. Meanwhile, Connor Myers, who hit just .191 last year, seems to have added “singles hitter” to his repertoire with an average just above .280 this year. Myers has always been an elite defender, but his adding the ability to hit for average really transforms his worth to the organization. Still, Myers is not the breakout hitter of the first half. That distinction belongs to Myer’s teammate, catcher Jhonny Pereda. Pereda is hitting a smooth .311 with 2 HRs and a team leading 23 RBI. He doesn’t strike out much and his monthly splits are ascending – hitting .304 with a .360 OBP in April and .324 with a .405 OBP in May. Arizona Phil of The Cub Reporter raved about Pereda this spring for his defense behind the plate. I was glad to read that. His offense, on the other hand, has been a complete surprise. 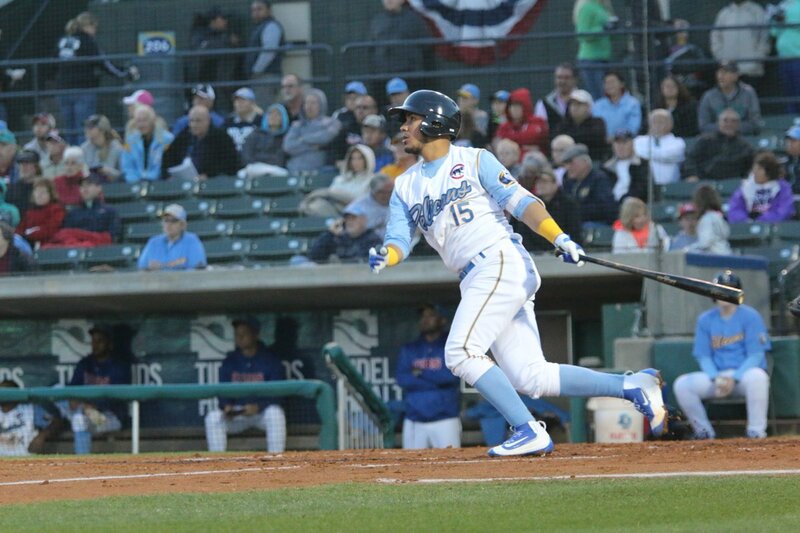 Last year, at South Bend, I got my first good look at Pereda. He got off to a great start in April hitting .344. Then he met a lot of pitches that began with the letter “C.” He struggled to hit in May (.219) and June (.153) before rebounding somewhat in July (.275) and August (.263). In the second half, he cut his K rate by a third and that has been the springboard for him this year. He rarely strikes out or even swings and misses, and tries to use the middle and opposite fields. In fact, about two-thirds of his batted balls have been hit to those directions, and he has one of the highest opposite-field percentages in the league. In addition, he’s been hitting consistent line drives. His line drive rate has been in the top 10 of the league all year long, so when you’re making that much contact and it’s almost always quality contact, good things are going to happen. It will be interesting to watch the aforementioned players try to maintain and sustain their development this spring. Ultimately, I think the Cubs are looking for a few breakthroughs, too.